On his first day of kindergarten in Steamboat Springs, young Bryan Fletcher arrived at school with his bald head painted green. His wardrobe was a green Teenage Mutant Ninja Turtles costume. Bryan was undergoing chemotherapy for cancer – specifically, acute lymphoblastic leukemia. Roughly a year earlier, he also suffered what ultimately was considered a minor stroke. The chemotherapy, which had started when he was 3, ultimately spanned five years. The treatments were mostly in Denver at Children’s Hospital, but later also in Steamboat Springs when the local hospital became better equipped. Along the way, he started skiing and ski-jumping, causing many of the adults around him to wince. His father, Tim, was on the Howelsen Hill ski patrol in Steamboat Springs. “There were a few people, my parents included, that weren’t sure I should be doing that,” Bryan said. “Obviously skiing is not an easy sport on the body and with everything that I was going through, there definitely would be days when I would come home exhausted. Not to mention that there were concerns that I might break bones, or that being out in the cold would be bad for me, or that I would wear myself down. When he was 8, doctors said the cancer was in remission. Bryan Fletcher is a survivor. More than 20 years later, he qualified for his second Olympics and was in line to represent the U.S. in the Nordic Combined – a blend of ski jumping and cross-country skiing, presumably with a rejuvenating snack of Norwegian lefse along the way – at PyeongChang in February. Fletcher claimed the USA’s one guaranteed Olympic spot at the U.S. Trials on Dec. 30 at Park City, pulling it off with a stirring recovery from a sub-par showing in the ski jump to claim the win on the strength of his effort in the 10-kilometer cross-country ski. “I’d say I gave it everything I had and if the finish line was 10 feet farther, I don’t know if I would have made it,” Fletcher told reporters after the race. In the event, the competitors’ starts in the cross-country skiing are staggered, depending on how they do in the ski jump, and Ben Loomis had a 1:24 head start on Fletcher at the Trials. Fletcher had four other racers to pass, too, and he pulled it off, beating Loomis’ brother, Adam, by 12.8 seconds. All wouldn’t have been lost if Fletcher didn’t win, because the Americans potentially could have claimed two more spots at PyeongChang, depending on international point standings in mid-January, but this enabled Fletcher to know more than a month in advance that he would be back for a second crack at the Winter Games. At Sochi in 2014, he was 22nd in the large hill and 26th in the normal hill event, and also part of the eighth-place team showing. Bryan’s brother, Taylor Fletcher, finished fourth at the Trials but later also was named to the Olympic team for the third time. Ultimately, four of the five members of the U.S. Nordic combined contingent were from Steamboat Springs. Bryan Fletcher is realistic about his chances at PyeongChang. He said he is considering retiring from competitive skiing after this season, and this likely will be his last shot at the Winter Games. If he does retire, he will have had an illustrious career – even more so when his childhood cancer battle is taken into consideration. After the remission, Bryan channeled more and more energy into skiing, with the Steamboat Springs Winter Sports Club. 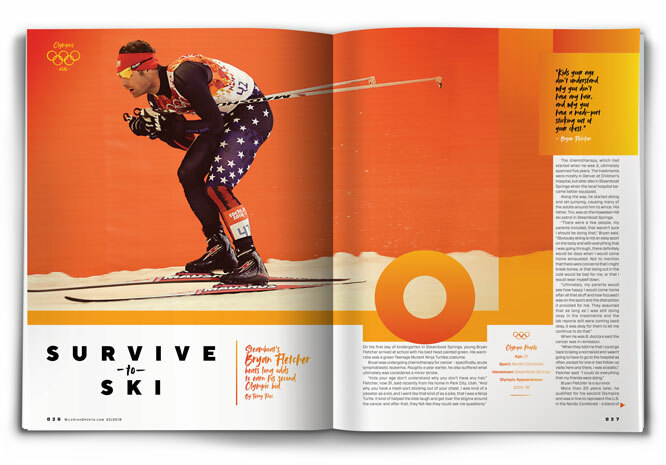 He finished up high school at the Park City Winter Sports School at the skiing site of the 2002 Winter Olympics, and he has been picking off credits at Westminster College in Salt Lake City and Utah State online ever since as he trains. His breakthrough on the international combined skiing circuit was in 2012, when he won the King’s Cup event at Oslo. Now, he lives with wife Nikki and infant daughter Ellery in Park City, focusing on family, his sport and his ccThrive charity (Thriving After Childhood Cancer, or www.ccthrive.org), which provides help for young cancer survivors. “We felt there was a need for inspirational stories from childhood cancer survivors,” Bryan said. “Obviously, when I went through my chemo, there weren’t a whole lot of stories to look up to. The Internet was still relatively young. You could hear these stories but you didn’t have the tangible aspect to them. To this day, there’s not a lot out there for kids. Most of the success stories are for adults. When you’re a kid, you want to talk to a kid, or look at the story of a kid who has been through the same thing.